Dear reader - I have a confession. 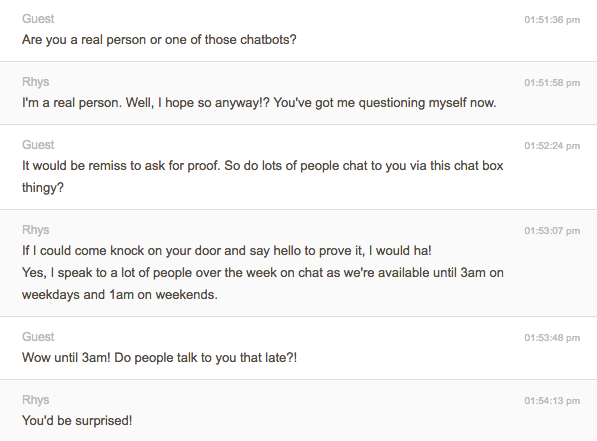 My name is Asad and I am obsessed with chatbots. Many moons ago I spent a large part of my professional career understanding how people interacted with brands via social media. It was termed a revolution at the time. The next level of customer service. And it was… to a degree. Companies invested thousands in retraining customer service teams to interact via social media, but the million dollar question was: how could businesses start making money through chatting to people online? Uber’s Chris Messina, Developer Experience Lead, predicted that 2016 will be the year of conversational commerce. Conversational Commerce is defined as “messaging apps [that] bring the point of sale to you”. Now Uber knows a thing or two about making commerce happen through technology. Despite the controversies, the company boasts an estimated worth of $62.5 billion and now operates in over 60 countries. Not bad going. Messina demonstrates that messaging apps have surpassed social networks on measures of daily user activity. It’s no wonder that WhatsApp started testing tools to allow people to communicate directly with organisations and that the tech press salivates over chatbot start-ups on a weekly basis. I’ve been scratching my head to work out how this will impact our favourite people: hoteliers. Booking.com last week announced its live chat feature and large hotel chains have also cited success. 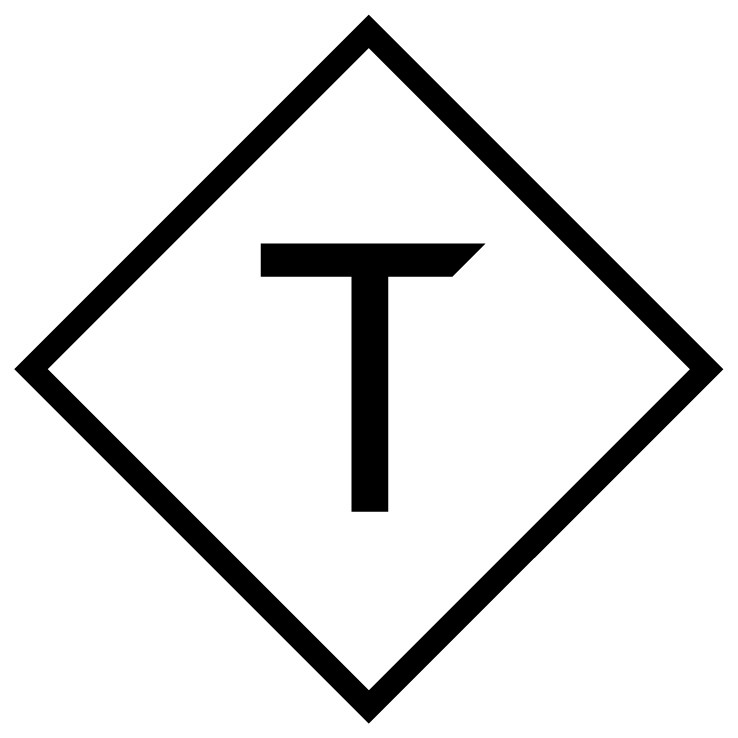 It's clear that it's going to be big, but what about the independent hotelier? 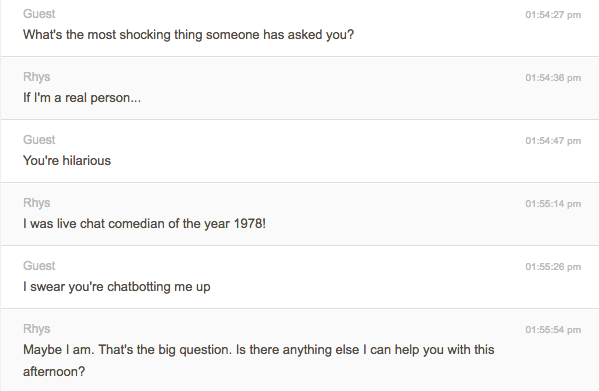 Is it about time we start chatting chatbots? I had a think about a potential trip to Birmingham and landed on the gorgeous Staying Cool Hotel. It's just one of thousands of hotels that use our Price Check Widget to show that direct is best. 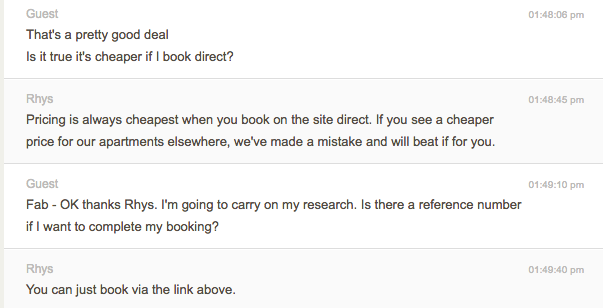 I decided to dive in and start speaking directly with the hotel about a potential booking. Rather than inputting the dates myself, I just asked the helpful agent Rhys about why I wanted to visit and the dates I wanted to be there. He gave me the link that took me through to the rooms and rates page. I was a little sad that Rhys disappeared from that page, but as it opened in a new tab I was able to go back and ask him a few more questions. I didn't have to click through calendars and simply had the work done for me. Genius. When the chat ended I entered my e-mail address for the transcript so I could save the URL. Ideal for Stay Cool as they can now send me more offers and get me excited about a potential trip. First - if you’re booking a last minute independent hotel in the wee hours the reassurance speaking to someone direct will have a big impact on trust. Second - front desk will need to stay open until the wee hours anyway. Why not make best use of downtime at the desk? The current rumblings in future forecasters focus on whether chatbots really can be run by machines alone. Indeed, Bloomberg investigated the humans hiding behind the chatbots. As you can see I asked Rhys outright. 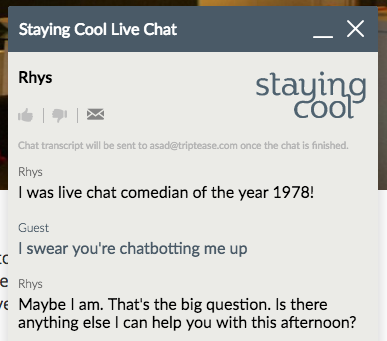 I think having a person behind a chat tool at a hotel can bring no greater joy when making a booking as you can see in my interaction with Rhys. 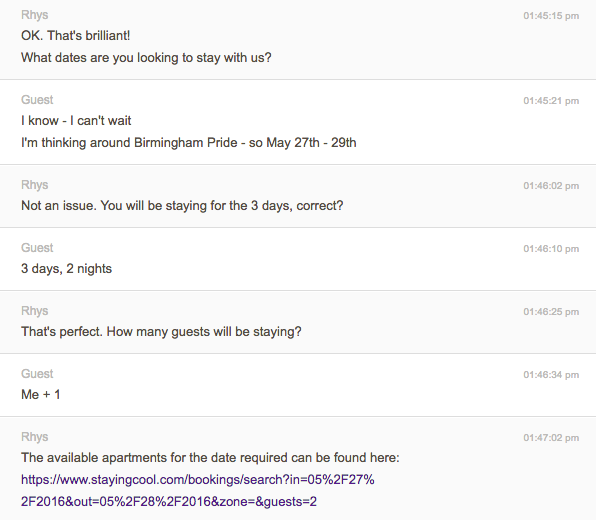 Independent hoteliers take note of the wonderful example from Rhys at Stay Cool Hotels.